Karl Theodor Jaspers (23 February 1883 – 26 February 1969) was a German psychiatrist and philosopher. Among his most well known contributions is his idea of the Axial Age [Achsenzeit]. As quoted in Philosophy for a Time of Crisis : An Interpretation, with Key Writings by Fifteen Great Modern Thinkers (1959) by Adrienne Koch, Ch. 18, "Karl Jaspers : A New Humanism"
Variant translation: It is the search for the truth, not possession of the truth which is the way of philosophy. Its questions are more relevant than its answers, and every answer becomes a new question. Auch das gesteigertste psychologische Verstehen ist kein liebendes Verstehen. Even the most elevated psychological understanding is not a loving understanding. One who would influence the masses must have recourse to the art of advertisement. The clamour of puffery is to-day requisite even for an intellectual movement. The general fellowship of our human situation has been rendered even more dubious than before, inasmuch as, though the old ties of caste have been loosened, a new restriction of the individual to some prescribed status in society is manifest. Less than ever, perhaps, is it possible for a man to transcend the limitations imposed by his social origins. The 'public' is a phantom, the phantom of an opinion supposed to exist in a vast number of persons who have no effective interrelation and though the opinion is not effectively present in the units. Such an opinion is spoken of as 'public opinion,' a fiction which is appealed to by individuals and by groups as supporting their special views. It is impalpable, illusory, transient; "'tis here, 'tis there, 'tis gone"; a nullity which can nevertheless for a moment endow the multitude with power to uplift or destroy. Even an articulated mass always tends to become unspiritual and inhuman. It is life without existence, superstitions without faith. It may stamp all flat; it is disinclined to tolerate independence and greatness, but prone to constrain people to become as automatic as ants. When the titanic apparatus of the mass-order has been consolidated, the individual has to serve it, and must from time to time combine with his fellows in order to renovate it. If he wants to make his livelihood by intellectual activity, he will find it very difficult to do this except by satisfying the needs of the many. He must give currency to something that will please the crowd. They seek satisfaction in the pleasures of the table, eroticism, self-assertion; they find no joy in life if one of these gratifications be curtailed. They also desire some means of self-knowledge. They desire to be led in such as way that they can fancy themselves leaders. Without wishing to be free, they would fain be accounted free. One who would please their taste must produce what is really average and commonplace, though not frankly styled such; must glorify or at least justify something as universally human. Whatever is beyond their understanding is uncongenial to them. One who would influence the masses must have recourse to the art of advertisement. The clamour of puffery is to-day requisite even for an intellectual movement. The days of quiet and unpretentious activity seem over and done with. You must keep yourself in the public eye, give lectures, make speeches, arouse a sensation. Yet the mass-apparatus lacks true greatness of representation, lacks solemnity. The would-be climber must be able to make himself liked ... please his superiors — avoid showing independence except in those matters wherein independence is expected of him by his chiefs... the winners in the race have qualities which disincline them to allow others to be their true selves. Hence the winners snub all those who aim at adequate self-expression, speaking of them as pretentious, eccentric, biased, unpractical, and measuring their achievements by insincere standards. 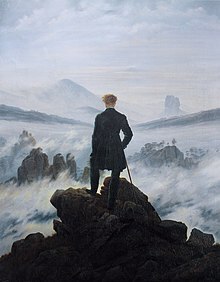 At the parting of ways in the life-order, where the question is between the new creation or decay, that man will be decisive for new creation who is able on his own initiative to seize the helm and steer a course of his own choosing — even if that course be opposed to the will of the masses. Should the emergence of such persons become impossible a lamentable shipwreck will be inevitable. Imminent seems the collapse of that which for millennium has constituted man's universe. The new world which has arisen as an apparatus for supply of the necessaries of life compels everything and everyone to serve it. It annihilates whatever it has no place for person seems to be going undergoing absorption into that which is nothing more than a means to an end, into that which is devoid of purpose of significance. Today war seems to have undergone a change of meaning, insofar as it is not a war of religion but a war of interests, not a war of conflicting cultures or civilizations but a war of national areas, not a war of human beings but a technical struggle of machines one against another and all against the non–combatant population. If the result of a war is to change nothing, but only to destroy, with the mere result that a group of human beings who do not differ notably from the conquered acquires preponderant advantages for the future, there is lacking the affective strength of an existence that has inspired faith, of an existence whose destiny would have been decided by the war. The possibility of peace, on whose behalf many are working, might perhaps become actual because the technical advances in offensive weapons make the prospect of a European war so disastrous, and because, if the nations were at grips again, even the victorious aggressor would be ruined. But there still remains open the possibility of a new war which, more dreadful than any that have preceded it would make an end of contemporary Europeans. It is questionable whether there does not exist in man an obscure and blind will to make war; an impulse towards change, towards emergence from the familiarities of everyday life and from the stabilities of well-known conditions — something like a will to death as a will to annihilation and self-sacrifice, a vague enthusiasm for the upbuilding of a new world. The vicious circle of dread of war which leads the nations to arm themselves for self-protection, with the result that bloated armaments ultimately lead to the war which they were intended to avert, can be broken in either of two conceivable ways. There might arise a unique world power, brought into being by the unification of all those now in possession of weapons, and equipped with the capacity to forbid the lesser and unarmed nations to make war. On the other hand, it may arise by the working of a fate to us still inscrutable which, out of ruin, will disclose a way towards the development of a new human being. To will the discovery of this way would be blind impotence, but those who do not wish to deceive themselves will be prepared for the possibility. Der Massenmensch hat wenig Zeit, lebt kein Leben aus einem Ganzen, will nicht mehr die Vorbereitung und Anstrengung ohne den konkreten Zweck, der sie in Nutzen umsetzt; er will nicht warten und reifen lassen; alles muß sogleich gegenwärtige Befriedigung sein; Geistiges ist zu den jeweils augenblicklichen Vergnügungen geworden. Daher ist der Essay die geeignete Literaturform für alles, tritt die Zeitung an die Stelle des Buches... Man liest schnell. The mass-man has very little spare time, does not live a life that appertains to a whole, does not want to exert himself except for some concrete aim which can be expressed in terms of utility; he will not wait patiently while things ripen; everything for him must provide some immediate gratification; and even his mental life must minister to his fleeting pleasures. That is why the essay has become the customary form of literature, why newspapers are taking the place of books... People read quickly and cursorily. In old days the plastic arts, music, and poesy were so germane to man in his totality that his Transcendence plainly manifest in them. ... What is to-day obvious to all is a decay in the essence of art. ... the opposition to man's true nature as man. Man, if he is to remain man, must advance by way of consciousness. There is no road leading backward. ... We can no longer veil reality from ourselves by renouncing self-consciousness without simultaneously excluding ourselves from the historical course of human existence. "There is no God," cry the masses more and more vociferously; and with the loss of God man loses his sense of values — is, as it were, massacred because he feels himself of no account. In the life of the mass-order, the culture of the generality tends to conform to the demands of the average human being. Spirituality decays through being diffused among the masses when knowledge is impoverished in every possible way by rationalisation until it becomes accessible to the crude understanding of all. As published in Existentialism from Dostoyevsky to Sartre (1956) edited by Walter Kaufmann. Text online at Marxists Internet Archive. My path was not the normal one of professors of philosophy. I did not intend to become a doctor of philosophy by studying philosophy (I am in fact a doctor of medicine) nor did I by any means, intend originally to qualify for a professorship by a dissertation on philosophy. To decide to become a philosopher seemed as foolish to me as to decide to become a poet. Since my schooldays, however, I was guided by philosophical questions. Philosophy seemed to me the supreme, even the sole, concern of man. Yet a certain awe kept me from making it my profession. Our questions and answers are in part determined by the historical tradition in which we find ourselves. We apprehend truth from our own source within the historical tradition. The content of our truth depends upon our appropriating the historical foundation. Our own power of generation lies in the rebirth of what has been handed down to us. If we do not wish to slip back, nothing must be forgotten; but if philosophising is to be genuine our thoughts must arise from our own source. Hence all appropriation of tradition proceeds from the intentness of our own life. The more determinedly I exist, as myself, within the conditions of the time, the more clearly I shall hear the language of the past, the nearer I shall feel the glow of its life. Existence, to him, had become a desert in which only one thing remained, namely that which had relentlessly forced him into this path: truthfulness that knows no limits and is not subject to any condition. … Nietzsche’s ideas and plans: for example, the idea of giving up the whole wretched academic world to form a secular monastic community. Rohde became more and more firmly bound to the bourgeois world, its institutions and accepted opinions. … The contrast between the two natures makes Rohde and Nietzsche exemplary representatives of two distinctive worlds. In their youth they both live in the realm of boundless possibilities and feel an affinity through the exuberance of their noble aspirations. Subsequently they go in opposite directions. Nietzsche remains young, leaving concrete reality as his task assumes existential import. Rohde grows old, bourgeois, stable, and skeptical. Hence courage is a fundamental trait in Nietzsche, plaintive self-irony in Rohde. … Rohde retained the interests but not the attitudes of his youth; he looked to the world of the Greeks for the object of his contemplation rather than the norm of obligation. For any community and those living in it, only that is true which can be communicated to all. Hence universal communicability is unconsciously accepted as the source and criterion of those truths that promote life through communal means. Truth is that which our conventional social code accepts as effective in promoting the purposes of the group. … This community will condemn as a “liar” the person who misuses its unconsciously accepted, and therefore valid, metaphors. … Community members are obliged to “lie” in accordance with fixed convention. To put it otherwise, they must be truthful by playing with the conventionally marked dice. To fail to pay in the coin of the realm is to tell forbidden lies, for, on this view, whatever transcends conventional truth is a falsehood. To tell lies of this kind is to sacrifice the world of meanings upon which the endurance of his community rests. Conversely, there are forbidden truths: This same threat to the continuance of the community is also counteracted by relentlessly preventing anyone from thinking and uttering unconventional but authentic truths. No one is guiltless...But no one is beyond the pale of human existence, provided he pays for his guilt. We are sorely deficient in talking with each other and listening to each other. We lack mobility, criticism and self-criticism. We incline to doctrinism. What makes it worse is that so many people do not really want to think. They want only slogans and obedience. They ask no questions and they give no answers, except by repeating drilled-in phrases. They can only assert and obey, neither probe nor apprehend. Thus they cannot be convinced, either. How shall we talk with people who will not go where others probe and think, where men seek independence in insight and conviction? [S]ome went through the whole disrupting experience of national indignity as early as 1933, others after June 1934, still others in 1938 during the Jewish pogroms, many in the years since 1942, when defeat became probable, or since 1943 when it because certain, and some not until it actually happened in 1945.
Review: "Karl Jaspers: Politics and Metaphysics"